Molina Parker was the recipient of a $5,000 entrepreneurial grant from the First Peoples Fund. Parker does beadwork pieces and plans to use the grant for supplies and to build a website to market her work. A piece of beadwork made by Molina Parker, who received a $5,000 business entrepreneurial grant from the First Peoples Fund, radiates in red. The grant allows indigenous artists to better pursue and market their work. The "starving artists" maxim is often true, but three local Native American artists will now have a little extra money to help them pursue their artistic passions. First Peoples Fund, a nonprofit that supports indigenous artists across the country, has awarded 27 grants in the new year, with three awarded to Black Hills artists. 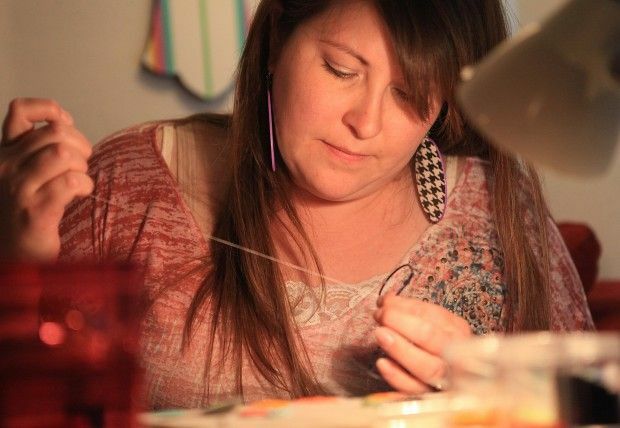 Rapid City beadwork artist Molina Parker, an Oglala Lakota, has received a $5,000 business entrepreneurial grant, while Rapid City flutist Darren Thompson, an Ojibwe, has won a $10,000 business entrepreneurial grant. Kyle-based stone sculptor and wood carving artist Brendon Albers, of the Cheyenne River Sioux tribe, has won a $5,000 cultural preservation grant and fellowship. "What's great about these grants is that they're artists who are mid-career with strong projects," said Jessica Miller, program manager of First Peoples Fund. "We're able to help them take their work to the next level, aid them with marketing, and really help them find financial independence." Miller said that the business entrepreneurial grants have worked well before, as Albers is a previous winner who was able to purchase better carving tools for his work and find a studio space. He'll use his grant this year to hold workshops on the Pine Ridge Indian Reservation to teach young people classic stone and wood carving skills. "We just play a small role for them," Miller said. "They take the initiative, and we provide what assistance we can." Thompson said that he learned of the award just prior to the Christmas holiday. "It's been challenging waiting for them to officially make the announcement," Thompson said. "I submitted back in August, so this has been a half-year in the making." Thompson, who manages his own career, said that his proposal was to use the grant for marketing. "Doing outreach and sending materials can be costly, so the grant is going to offset sharing and distributing costs," Thompson said. "Word-to-word and in-person stuff always works, but I can't be everywhere all the time, so this will expand my reach to new organizations." Thompson has already started setting up meetings with media ahead of time and updating equipment. "My computer was on its last leg, so that's one of the things this is funding," Thompson said. "I can update how I manage invoices and my inventory, and I can publish more albums so they're better available." Thompson said that album pressings were particularly prohibitive, as CDs cost $4 or $5 per unit in smaller orders. "Now I can get a larger quantity to keep costs down and profit up," said Thompson, who is also working on new musical material. Parker said that she had her own challenges as an artist and a stay-at-home mother, which kept her from having the money to create larger works of art that she could enter in art shows. "This is going to enable me to buy the supplies I need that I normally couldn't afford: antique beads, tanned leather, rawhide that's been treated properly," Parker said. "That stuff tends to be fairly expensive, so this will give me the financial freedom I need to spend it on larger pieces." That newfound freedom is particularly encouraging to Parker, who only learned she had won two weeks ago after initially expecting news by Thanksgiving. "I figured I didn't get it, and thought, 'Well, that's OK, a record amount of people applied,'" Parker said. "When they called me, I was in shock, my face went numb, I got on the phone with my husband and just started screaming." Parker has already sketched out new works, including a fully beaded purse, a beaded vest that fellow grantee Thompson had asked for, and beaded portrait that is a memorial to her grandmother. She also plans to improve her website to more professionally market herself. Both Parker and Thompson said that they felt honored to be a part of the First Peoples Fund's artists. "It's difficult to push forward, but I hope people see this and realize that if they keep following their dreams, it makes a difference," Thompson said. "The 'starving artist' thing is true,'" Parker said. "It's hard to make money off of your work unless you have the tools and someone buying on a regular basis. So this does a lot of the promotion that needs to be done."